There are 10 different forms of positivity (probably more than 10, but let’s focus on these amazing 10 first). 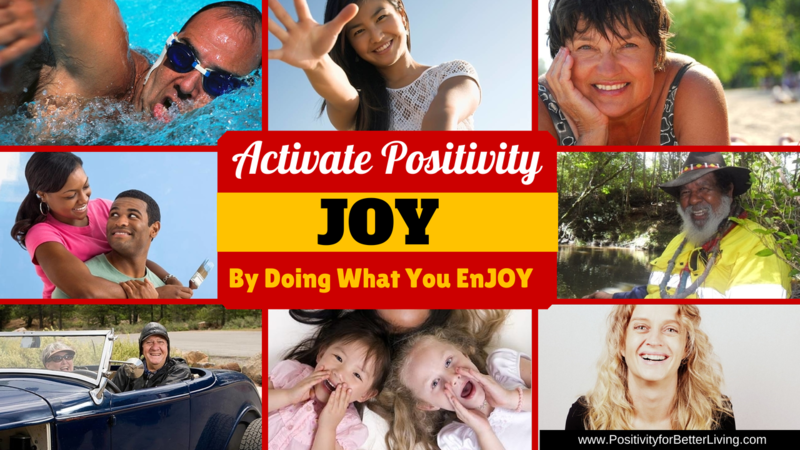 JOY is an uplifting and exhilarating experience. Joy is a mind broadening form of positivity because when you are feeling joyful you have an urge to play and enjoy life. This includes exploration, creativity, physical and social play, intellectual and artistic play – which, to sum up, broadens your thoughts and actions. Activating your own or your staff’s joy and interest broadens their minds – rather than the usual narrow minded workers in many businesses robotically going about their work. INSPIRATION Feel invigorated and inspired to expand your mind and actions when something awakens your creativity and innovation. When you feel inspired you feel delightfully influenced towards acting in the moment, or experience an AHA moment of inspiration or feel inspired by someone who has achieved something you admire. PRIDE An amazing deep satisfying feeling is when you feel pleasure in your own achievements. When you take the time to recognise and admire your qualities and accomplishments you fuel your motivation and inspiration towards success. Pride can be shared with others as you delight in their success and triumphs. GRATITUDE is a powerful positivity vibe that opens your heart and mind and instantly shifts the fog of a negative mindset. It has the power to turn bad things into good. You feel grateful when you appreciate what someone else has done for you, for your environment or situation. Being grateful makes a difference because it reminds you of the positive things in your life. HOPE is an important positivity vibe because even in a dire situation you hold the belief that things can change and possibilities exist. Hope is a wish that good things will come, and this wish keeps you moving forward no matter what adversities you face. Hope has been proven to increase employees’ effectiveness and grow their resilience so they bounce back from setbacks and easily flow with workplace changes. FASCINATION (interest) is a captivating experience as you feel drawn to explore new things. You eagerly venture on a journey to build new skills or awaken new ideas within yourself. Fascination has vast mind broadening capabilities. When you’re interested and fascinated you feel alive and animated and are open to new ideas and experiences. Interest is therefore a very important form of positivity in business or the workplace to increase innovation and creativity. AWE You have reached the end of a great journey and feel awed by the mountain of sparkling gold in the treasure chest at your feet. You have an overwhelming feeling of admiration for the woman who has overcome many obstacles and is now a huge success. The natural beauty of the vast waterfalls takes your breath away and you feel awed. Awe has the power to take you far beyond your usual way of viewing the world. It’s expansive and delightful. SERENITY Feeling serene is a soothing, calming influence on the body, mind and soul. Serenity is when you feel at peace with your world. You feel calm and untroubled. You are in safe and familiar surroundings and you can sit back, relax and soak it all in. People feel serenity when they are meditating, walking in nature, watching the sunset or sunrise and during physical exercise. AMUSEMENT is an uplifting and entertaining vibe that brings laughter and builds connections. Have heard the saying that Laughter is the Best Medicine? Humour and amusement are helpful coping mechanisms and is a powerful character strength that eliminates barriers and broadens the mind to seeing new opportunities. LOVE is constantly bombarded with definitions and meanings within society. It is noted through society as being necessary for romantic endeavours, for the love of being a parent, for the love of chocolate, for the love of culture or country and so on. However, the true feeling of love is more easily experienced than defined. When you experience love other forms of positivity come into play. When you share joy and amusement with others you feel love. When you feel grateful you feel love. Love is unique for each individual. The video below is one of the LECTURES in the “How to Activate Positivity for Better Living” course on UDEMY. You’ll enjoy a more in-depth knowledge and experience of activating positivity in this course. PRICE COUPON code.